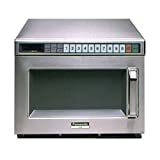 If your commercial foodservice operation is seeking a stellar microwave oven, look no further than Panasonic’s 1, 700 Watt Microwave Oven – Pro I Series (NE-1757). This unit is built to withstand use in a busy kitchen. It has a sturdy stainless steel cabinet and cavity. The microwave oven has two heating elements, as well as a top and bottom energy feed system. Operators will require little to no training, as the controls are simple-to-use and the door handle is “grab and go”. The unit accommodates one 6” tall full size pan for the maximum in versatility. This Panasonic microwave oven has a large internal capacity at 0. 6 cubic feet. Features: Stackable unit, 15 minute cook time, One touch start keys, 30 minute defrost time, Air filter cleaning reminder, Patented safety door seal system, Technical support provided by chefs, Fits one 6" tall, half-size steam table pan. Benefits: Self-diagnostics for easy upkeep, Clear door allows easy viewing of food, Removable ceiling splatter shield for easy cleanup, Two heating elements provide more even cooking, "Grab and Go" pull door handle increases chef speed and efficiency. Additional Considerations: Receptacle required: NEMA 6-15R or NEMA 6-20R.